How did you learn guitar? Did you take lessons? Or were you self-taught? I took four extremely worthless lessons after I had already been playing for several years. Lesson material was probably from the Mel Bay Plectrum Guitar Method series though I don’t remember for sure. What I do remember from that time was first, no one was interested in finding out what I wanted to learn and second, there just wasn’t a lot of instructional material available. If you are young, let me summarize the primitive state of the universe at that time. There was no internet. No cell phones or smart phones and thus no phone apps. There was no personal computer – not even the Apple II – thus no music software. There was no DVD, no HD, no video at all unless you were in television production – so no video or YouTube lessons. Not only did we not have MP3s, we didn’t even have CDs. Eventually we got 8 track and cassette tapes but when I was learning guitar, music was on vinyl – either 45 rpm (singles) or 33 1/3rd rpm (LP) – Stereo LPs were no yet available. However, I am at least nostalgic about some of this material and believe there’s still some good stuff here. Still, 1960 guitar instruction is going to have a hard time holding up to interactive software, on-demand video instruction or just the quantity and variety of material available today. My first guitar instruction book was the Folksinger’s Guide by Jerry Silverman (ISBN-10 0825600138). This was actually supposed to be the supplemental text to an instructional LP record album by Pete Seeger. The Jerry Silverman book is currently out of print but still available through used book dealers (e.g., on Amazon). The Pete Seeger album is available as MP3 downloads: Folksinger’s Guitar Guide, Vol. 1: An Instruction Record by Pete Seeger along with Folksinger’s Guitar Guide, Vol. 2: An Instruction Record by Jerry Silverman. However, back when I was a kid, I never could find the albums and had to be satisfied with just the book for instruction. The good news was folk music was still familiar to most people so I knew how most of the songs should sound. And folk music is simple – often just three chords. Great for a beginner. I learned my first chords and first songs from this book. I learned hammer-ons. I learned a number of different types of picking and strumming patterns and some simple bass runs. It was all good if a bit primitive – except for the parts that were too difficult. The biggest challenge from the book that I attempted to master was playing Elizabeth Cotton’s Freight Train. I never got the tab just right and eventually settled on trying to emulate the Peter, Paul and Mary recorded version as best I could. I also never really got two finger picking while playing alternate bass notes with my thumb until decades later when I found better instructional material. 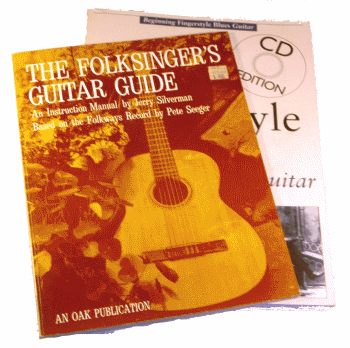 My conclusion: I feel a strong nostalgic attraction to the Folksingers Guitar Guide but there are much better books available for beginners now. If I had to do it again today (which thankfully I don’t – that doesn’t even make sense does it?) I’d choose something else as my first guitar instruction book. What would I choose for a beginner? I’ll write something about that later. The answer depends on who you are (adult or child, never played guitar or played a little, never played an instrument or played something sometime) and what you want. “What do you want?” is the question I was never asked during my four lessons. But I will tell you the book that finally taught me the alternate thumb blues picking that I couldn’t master from the Folksinger’s Guide. That book (and CD) is Beginning Fingerstyle Blues Guitar (Book and Audio CD) by Arnie Berle (ISBN-13 978-0825625565). David Gilmour of Pink Floyd also taught himself to play bu listening to the Pete Seeger record!